My friend, and fellow bon vivant, Marie aka Agent Lover and I love brunch. (Who wouldn’t? You can sleep in late and still get breakfast foods and booze!) We’d toyed with the idea of starting a brunch club and finally, thanks to a vampire baby, Ladies Who Brunch was born. Our craving for eggs and weakness for the Twilight movies set the date for our maiden brunch voyage for this past Sunday. 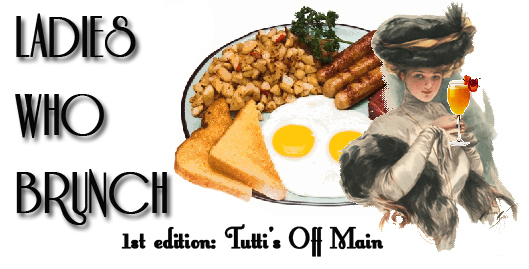 The first stop was Tutti’s Off Main, in Ventura, CA. Unfortunately, it was raining, so we weren’t able to take advantage of their lovely (pet friendly!) patio. When we arrived the dining room was only about 1/3 filled, I think the weather thinned out the morning’s usual brunch rush. I noticed a dude with a guitar stationed in the corner and cringed. I’m not usually a fan of live music playing while I’m eating. I feel awkward and vaguely assholey stuffing my face while someone is singing for their supper brunch. But this guy was great, he played a good variety of songs and all at the perfect volume – not loud enough to drown out conversations, but loud enough to cover up the sound of chewing and fill in lulls in in chit chat. The menu was a bit different from the one posted online, so I had to rethink my original plan of attack. I’d planned on ordering the Eggs Benedict, but it wasn’t on the menu that morning. So I went with the Prosciutto Pizza. 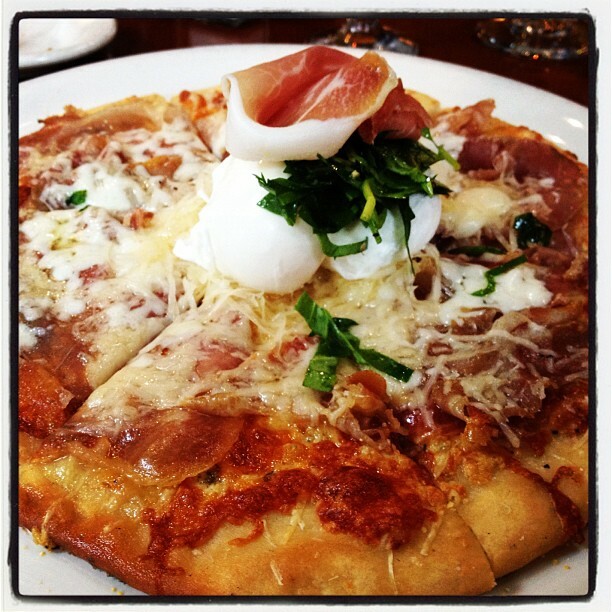 It’s a thin pizza crust, served with prosciutto, three cheeses and topped with two poached eggs. The first thing I did was go in for a piece of the crust, it was crunchy on the outside and soft on the inside – just how I like it! The prosciutto was incredible, salty and crisped up from baking in the oven. The cheese blend was tangy and flavorful, and the eggs were perfectly poached. It was a fantastic flavor combination, everything worked together magically. It was a little messy, but I couldn’t make myself knife and fork it. It was too good, and I needed to get my hands all up on it, sopping up the yolk and every bit of cheese. Marie was caught between the Breakfast Crepe and Crab Benedict, both which sounded delicious. I loved the way she decided, “I’m going to be decadent and do the crab!”. Brunch is not for the meek, my loves, you gotta go big or stay home and eat Corn Flakes. 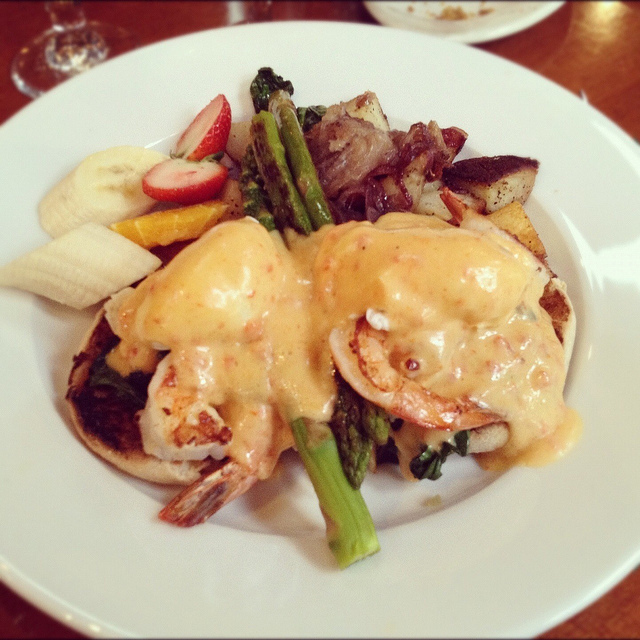 This was Eggs Benedict turned up a few notches – two poached eggs on English muffins with crab, shrimp, asparagus and Hollandaise sauce. It was served with yummy potatoes (Marie gave me a taste, and I wanted to steal a few more) and fresh fruit. I got a sample of the dish (strictly for scientific blog purposes) and it was so good. I don’t care much for crab, and would never normally order it, but this was really tasty! I like that it was served with fruit, in case you got a little overwhelmed by the richness of the main dish. Some Yelp reviews mentioned slow or rude servers, but I think it’s just a more European style of service we Yanks aren’t used to. 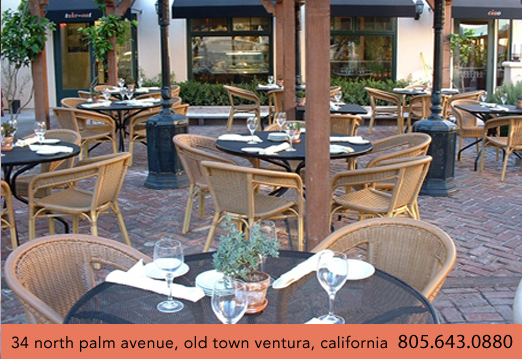 You’re expected to take your time and enjoy the meal with minimal interruptions. True, our server wasn’t very chatty but she did refill our waters (before we were empty) and the food was brought out fairly quickly. We were greeted warmly and seated immediately, after placing our order our server brought a plate of mini breakfast pastries & bread (zucchini bread, cinnamon roll with icing, and cornbread muffin). They were great for sharing, just enough for a few bites while we waited for our meal without ruining your appetite. The meal portions were generous without being super sized, ideal for brunchers who want to share. Marie and I both cleaned our plates, and were pleased as spiked punch with our first official meeting of our brunch club. Thanks to Marie for the official LWB header and the late night brain stormin’.